Nobody has gone through life without daydreaming about the perfect in-ground pool. Right now you probably already have the mental image. Making that dream a reality can be challenging, but it doesn’t have to. There are plenty of small details that are already filled in in your head, but how can you capture each bit? In this article I’ll take a look at a few steps toward designing the pool space of your dreams. By looking at ambiance, design elements and your needs we can take a holistic approach to pool design. Realizing your dreams means you have to dream it first! If you’ve already got that crisp mental picture, you’re ahead of the game. If you haven’t really thought of it before, let’s try an exercise. Feel free to be imaginative and wild here, we’ll get down to the “nitty-gritty details” later. Here are a few questions to put you on the right track. Close your eyes and really imagine before you answer! Do you imagine your pool as a community gathering space for friends and family? Do you need plenty of room for more people? Or is it more of a secluded space where you can relax alone or with someone special? Is this an open, inviting space? Or a secluded, private space? What is the “world” your dream pool occupies? Does it have a theme? Is it a lush jungle? A tropical island? A Hawaiian resort? A Cape Cod beachfront? Is there a particular time of day you imagine it in? Is it well-lit or sun-drenched? What about the pool itself– how big is it? What shape is it? Do you want a gradual slope or a sudden deep end? Will there be a diving board? A wading area for young kids? A bar nearby? Now that we’ve dreamed up the ideal pool, it’s time to get real! Now we’ll start taking elements of that pool you’ve dreamed up and find out how we can make them a reality. One or two things may not make the cut. Rather than looking at those things as “impractical,” we’ll try to think of alternatives. It may be difficult to get a full orchid garden and grove of mango trees into a tropical pool theme when you’ve also got to endure Canadian or northern US winters. But that just means we’ll need to get a little more creative in order to fit those needs. Landscaping is something that can be easily overlooked for a pool. The pool itself is the light at the end of the tunnel, and then you get your pool in and it feels… a little lackluster on its own. Adding some plant elements around really brings the space to life and makes it more exciting. When picking plants, remember to consider your climate zone. Even if you’re in a place with tough winters, a little research will turn up exotic plants that will flourish. Hibiscus, musa basjoo (“hardy banana”), hostas, natal lillies, and bromeliads are all great winter-hardy plants that, when combined, give a warm and exotic feeling. And don’t stop at plants! Creating gravel paths, rock features, and other garden staples can add to the impact of the space. After all the work you’ve put into creating a beautiful pool space, you want it to be useful at night as well. Throwing on the backyard floodlights when the sun goes down will kill the whole ambiance you’ve built. There are tons of great, affordable soft lighting options. And if you’re concerned about power, solar lighting fixtures are becoming more common by the day. Consider adding in-pool lights for nighttime swimming. Concrete-mounted pole lights can light up pathways. Higher lighting fixtures like patio strings or lanterns are great for general lighting. Even if you want your pool to be a big, open, family space– privacy is still a concern. Hard to relax by the pool when you feel like you’ve got the whole neighborhood watching you. Privacy comes in many shapes and sizes, and you don’t need harsh or ugly fence panels to add privacy. Consider using a mix of fencing, furniture, and plant elements to help keep prying eyes out. The first thing you think of when someone says “pool furniture” is probably those plastic strap loungers. They’re uncomfortable and will sear you like a grilled steak when they’re out in the sun all day. But let’s break out of the box. Think about the furniture you’d like to have, but also about the spaces you can create with that furniture. Should you create a concrete patio space near the pool so you can enjoy a drink after your swim? Is there a patio set you’d like to base your ambiance around? Will there be changing spaces? And of course, to tie everything together, you’ll have to make the space usable. You’ll need safe, accessible walkways, a nice pool deck space, and any other patio, sitting, or social areas. Getting these functional spaces to tie into your greater design will really be the key to having an amazing pool space. It’s hard to overstate how much the flat, practical areas can add to (or detract from) a well-designed pool. There are dozens of materials that can connect the garden spaces, the living areas, and the pool. Many people opt for wooden decks, brick pathways, or flagstones to combine chic looks and safety. Putting in hours of design work only to have a lackluster, flat concrete walkway can take away some of the magic. Spruce it up with some tiles and light fixtures–and even these small additions make a big difference. 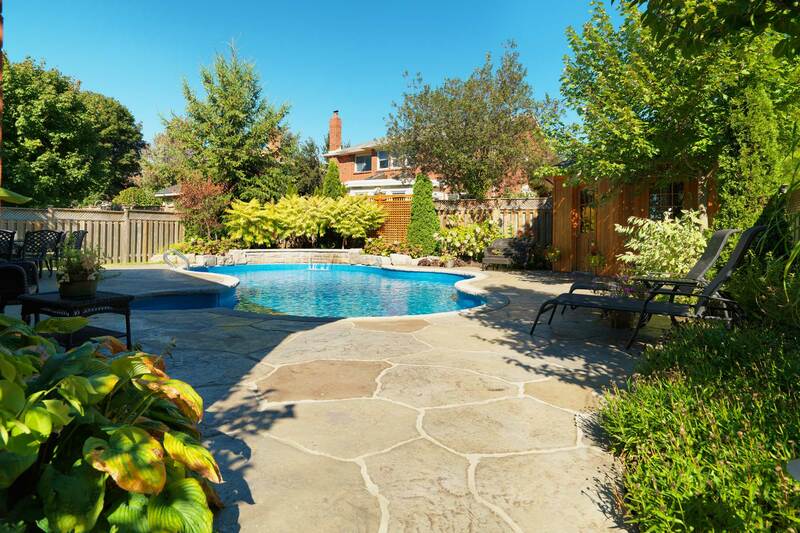 If a flagstone or brick pathway seems to fit in with your dream pool, you may balk at the price. One option to keep this final element under budget is to look into stamped concrete. Stamped concrete can give you the DIY look of brick, flagstone, and even wood pathways. We’ve worked hard to perfect these processes so that they’re very affordable. And they’re almost indistinguishable from the real thing! Uniform concrete gives less risk of slipping or stubbing your toes on a misplaced stone. In my experience, stamped concrete is a great way to tie together other design elements while keeping your reality looking like a dream. It’s hard to make your dreams into reality for so many projects, but don’t let your pool be a failure of imagination! By carefully considering your poolside wish list, and considering elements to make it possible… your dream pool isn’t a dream at all! Remember to consider the ambiance you want, and then look at how you can accomplish that. Use plants, lighting, furniture and a little know-how. You’ll end up with gorgeous community spaces and a pool that really feels like it was worth the wait.